Borussia Monchengladbach midfielder Thorgan Hazard has emerged as a potential transfer candidate for Liverpool ahead of the winter transfer window. The Reds are currently well stocked in the attack front but manager Jurgen Klopp still appears keen on pursuing at least one forward at the turn of the year. According to Liga Financial, the Reds have been impressed with the showing of Thorgan this campaign and they may be tempted to trigger the £26m release clause in his contract. 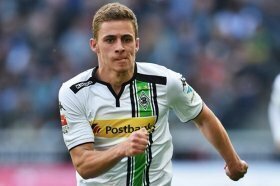 Thorgan, who is the younger sibling of Chelsea's Eden Hazard, has just 18 months remaining on his contract with Monchengladbach and that may have potentially captured the Reds' eye. He has enjoyed a fruitful start to the current season with eight goals and six assists for the German club, who are presently only behind Borussia Dortmund in the league standings. Meanwhile, any potential winter signing for the Reds may come about with a departure with Divock Origi tipped to make way when the transfer window.